On the 5th day of protests, the Border Guard Bangladesh (BGB) came forward to shoot fiercely. The general people began to take cover under protection on advice of the leaders. 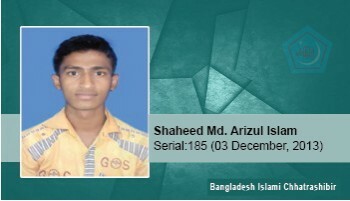 Shaheed Arizul Islam also heard that RAB, police and BGB were advancing. When the people came out to prevent them from advancing spontaneously, and Shaheed Arizul Islam was heading towards the side of the road doing the same, he raised his head, and a bullet hit his throat and went out behind the neck. He attained martyrdom on the spot.